ShipStation is an important addition to the product, one that helps online retailers improve their bottom line even more. 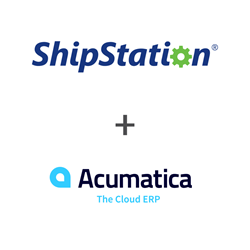 Today ShipStation, the leading web-based e-commerce shipping solution, announced its integration with Acumatica Cloud ERP. Acumatica is a top provider of cloud business management software that gives e-commerce clients a complete, real-time business view—anytime, anywhere. ShipStation helps online retailers save time and money in many ways. One is by creating Automation Rules and Product Defaults for users that allow them to use multiple shipping carriers, such as USPS, UPS, FedEx, DHL, Canada Post, Royal Mail, that immediately provide the best carrier option depending on product, geography and other criteria. In addition, each ShipStation subscription in the U.S. includes a free Stamps.com USPS shipping account (savings of $15.99 per month), which includes discounted USPS rates. ShipStation also allows merchants to create branded shipping labels and packing slips, which can be printed in batches as large as 500 or more. Acumatica customers who choose ShipStation will have access to ShipStation’s simple yet powerful cloud-based, multi-channel shipping solution. ShipStation offers connections to more than 150 other selling channels, including Amazon, Etsy and eBay, so that all orders are imported into one location to be managed in ShipStation. The order status and tracking information from those stores can be sent automatically once an order is shipped. Finally, the customer experience is elevated with ShipStation’s branded e-mail confirmations, tracking page and returns portal. The ShipStation Acumatica integration was built by Kensium, a ShipStation partner and Acumatica’s official e-commerce partner. Kensium has the largest team of certified Acumatica developers and several Acumatica certified extensions, including the Magento Connector, Shopify Connector, BigCommerce Connector and Product Configurator. ShipStation is the leading web-based shipping solution that helps e-commerce retailers import, organize, process and ship their orders quickly and easily from any web browser. ShipStation features the most integrations of any e-commerce web-based solution with over 150 shopping carts, marketplaces, package carriers and fulfillment services. ShipStation's many integration partners include eBay, Jet, PayPal, Amazon, Etsy, BigCommerce, WooCommerce, Shopify Plus, Squarespace and Magento; along with carriers such as FedEx, USPS, UPS, Canada Post, Australia Post, Royal Mail, and DHL. ShipStation has sophisticated automation features such as automated order importing, custom best practice rules, product profiles and fulfillment solutions that enable its users, wherever they sell and however they ship, to be exceptionally efficient at shipping orders. ShipStation is a wholly-owned subsidiary of Stamps.com (Nasdaq: STMP). For more information, visit http://www.shipstation.com. Acumatica is a complete cloud ERP solution for all the business management needs of e-commerce companies, including accounting, inventory management and CRM. It helps small and mid-sized retailers provide a multi-channel ordering experience, improve the in-store experience and automate how online sales orders are taken and fulfilled—all while improving operating efficiency. Acumatica can accommodate the needs of a single location or multi-channel sellers. For more information, visit https://www.acumatica.com/. Kensium is a system integrator and digital commerce company that develops scalable Magento Commerce websites and implements Acumatica Cloud ERP solutions. With more than a decade of e-commerce experience and 60 trained Magento 2 professionals, Kensium has the knowledge and expertise to help accelerate merchant growth through website development, system integrations, e-commerce strategy and technical SEO. They are a Magento Enterprise Partner and the leading partner in Magento Cloud implementations.